More than 300 boat owners at Hawai‘i island’s Honokōhau Small Boat Harbor are being advised by the Hawai‘i Department of Land and Natural Resources Division of Boating and Ocean Recreation (DOBOR) to contact the new operator of the harbor’s dry marine storage facility. Pacific Marine Partners LLC (dba Honokōkau Marine Storage) assumes operations of the 9-acre boat storage lot on Nov. 1, 2018, following the termination of a revocable permit (RP) by the Board of Land and Natural Resources (BLNR) in August. On Sept. 14, 2018, DOBOR staff is informing owners who have vessels or trailers stored on the lot—by phone, e-mail and via a flyer—to contact the new operator to continue their leases without interruption. The previous operator, Gentry Kona Marine (GKM), has posted large “notice-to-vacate” signs on the fence and gate leading into the boat storage facility. The signs state that boat owners must move their boats/trailers by Oct. 14, 2018. The signs have prompted many boat owners to call the DOBOR office at Honokōhau. 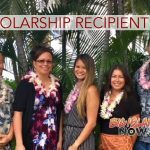 They are being informed that they do not need to vacate the property and are strongly advised to contact Honokōkau Marine Storage to make rental continuation arrangements. For the last several years the BLNR has directed that DLNR divisions transition RPs to long-term leases, if leases offer the best possible use for a specific property. DOBOR had intended to consolidate the GKM revocable permit into a lease through direct negotiation, but was advised by the Dept. of the Attorney General that public auction is the most appropriate method to offer the property. In July a public auction sale was held and Pacific Marine Partners LLC was the successful bidder. Subsequently GKM was notified it was being terminated as the operator of the facility and given until Oct. 31, 2018, to vacate. 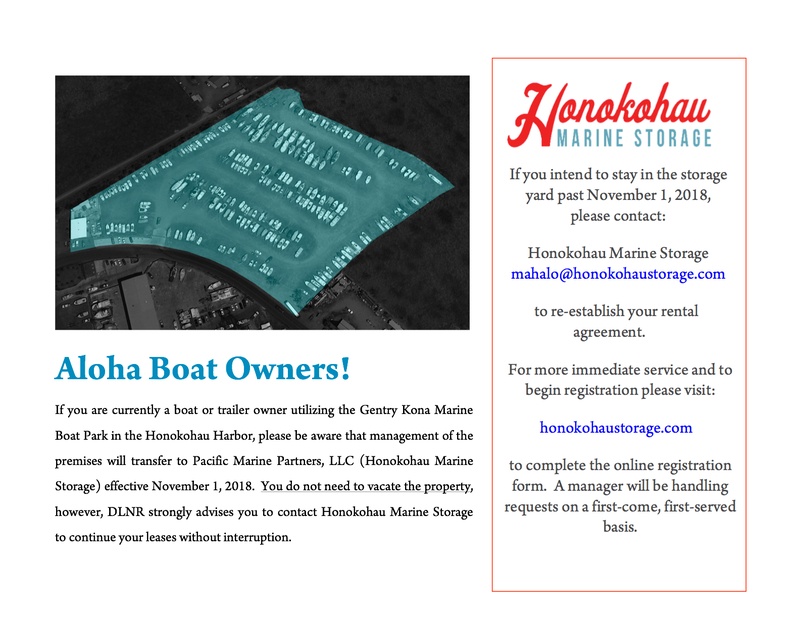 For more information, boat owners can contact mahalo@honokohaustorage.com or begin the registration process at honokohaustorage.com.